Paul McGann’s Eighth Doctor has had a marvelous existence in Big Finish’s audio adventures. Through them, we’ve been able to see how this eccentric, passionate, and occasionally dour Doctor lived between his birth in the 1996 TV movie and death in “The Night of the Doctor.” Adding greatly to the popularity of these adventures was companion Lucie Miller, played by the superb Sheridan Smith. Outspoken, indomitable, and even caustic at times, Lucie was the perfect foil to the Eighth Doctor, balancing his melancholy as much as Sarah Jane Smith’s tenacity redeemed the Fourth Doctor’s recklessness. What really stood out, though, was that the character felt real. Last heard in 2011’s “To the Death,” Sheridan Smith and Lucie Miller have returned in “The Curse of the Fugue” – and it’s like they never left. The 30-minute tale is part of Big Finish’s Short Trips range, where one actor reads an original story (as opposed to Big Finish’s full-cast audio plays). Alice Cavender’s story drops us into 1974 London, during an energy crisis, and where we find Lucie working in a nursing home. But why? Where is the Doctor? And is resident Cecille’s invisible friend a figment – or a messenger from the past with a dire warning? The story takes a little while to develop, but that’s fine because it does an admirable job of creating a true 1970’s feel and establishing key characters like Cecille. It’s also fun to hear Lucie – who’s not at all happy about her apparent abandonment by the Doctor – casually sharing future news tidbits with the ’70s residents. An added treat is Sheridan’s interpretation of the Eighth Doctor. She handles both roles extremely well. Additional: Big Finish is hosting a Short Trips writing competition this month! Fancy a chance at writing your own Doctor Who tale for the Big Finish website? Check out the details here. Big Finish’s new audio release sets the bar pretty high: How do you address one of the most nagging and least-liked outcomes in Doctor Who history? Quick refresher: At the end of Mindwarp (part of the knotty Trial of a Time Lord), the Sixth Doctor’s first companion, Peri, is either – take your pick – abandoned, mindwiped, and killed OR rescued by a barbarian warlord and becomes his queen. The pleasant surprise is that The Widow’s Assassin wildly succeeds, doing for Mindwarp what X-Men: Days of Future Past did for X-Men: The Last Stand – cutting the original tale’s Gordian knot and spinning gold out of the pieces. Writer Nev Fountain waded into Mindwarp’s mess once before, in the clever Peri and the Piscon Paradox. Here he tackles the problem head on, coming up with an answer that not only maintains continuity but clears the path for a new, refreshing wave of post-Trial Sixth Doctor and Peri adventures. 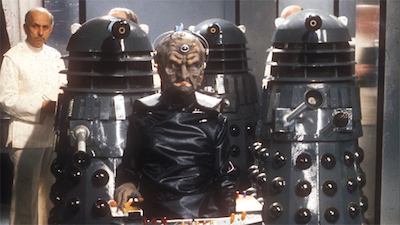 The tale kicks off with the Doctor traveling to Krontep, seeking forgiveness for betraying and abandoning Peri. But the bride-to-be is not in a forgiving mood. The fairy-tale/murder-mystery mashup that follows is full of drama, sadness, marvelous timey-wimey, and lots of humor. (I really did laugh out loud in spots.) There are a couple of jaw-dropping shocks, plus moments of giddy revelation, as we see the Sixth Doctor playing the Long Game in shrewd, scheming ways we’d associate with the Seventh and Eleventh Doctors. Excelling throughout are Colin Baker and Nicola Bryant. While their TV relationship was sometimes maligned as one of the most unpleasant Doctor/Companion pairings, The Widow’s Assassin shows us where their relationship could have – and should have – gone. The Doctor’s abrasive personality has been mellowed by years of traveling, and dire circumstances have forced Peri to adopt a more mature outlook on life. 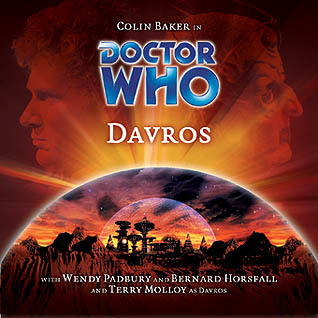 Baker wonderfully conveys the Doctor’s earnestness and confusion when he first approaches Peri. (He also contributes to the story more than you think.) Bryant gives us a confident yet sad Peri who reveals new layers to her personality – in more ways than one. The Widow’s Assassin jumps straight into the Top 5 releases of Big Finish’s Doctor Who line. After listening to this, you’ll finally be able to rewatch parts of Trial of a Time Lord with a smile on your face, which is probably the highest praise that a Doctor Who fan can give. It’s available on the Big Finish website. Big Finish has been creating wild, thrilling Doctor Who audio adventures since 1999. Along the way, we’ve met several new Companions (a few of whom were name-dropped into official Who canon in The Night of the Doctor). Of these, perhaps the most creatively successful is Evelyn Smythe. Created by Jacqueline Rayner and voiced by Maggie Stables, Evelyn is the type of Companion not seen on TV Who to that point. She’s 55 when we meet her, can’t run well, acts independently, and constantly calls the Doctor out on his bad manners. And when “her” Doctor happens to be the Sixth Doctor (Colin Baker) in the early post-Peri years, she calls him out a LOT. She’s an excellent character who is partly responsible for the growth of the Sixth Doctor’s mellower, more reflective persona in later Big Finish releases. Evelyn’s first adventure with the Sixth Doctor is that rarest of treats: a historical! No aliens or monsters – just human beings in 16th century England. The Doctor traces a temporal fault to Professor Evelyn Smythe in the year 2000 and he tells her that her family history is being wiped out. The solution? Go to the source of the problem in the time of the Tudors! 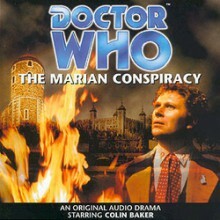 But when she’s pulled into a conspiracy to assassinate Queen Mary, will the Doctor’s solution cause more harm than good? Pros: Worth repeating: a historical! Evelyn’s confidence and sass, right from the get-go. Her understandable belief at one point that the Doctor is her great-great-etc.-grandfather! The Doctor’s dark admission of the many mistakes he’s made. Good times. Cons: None really, unless you’re against historicals, in which case you’re a fiend. In the Clutch, a massive space fleet in constant motion, the Galyari are being stalked in the shadows by a boogeyman from their distant past, a bloodthirsty monster known as the Sandman. It is death to look upon him. He is also called… the Doctor. This tale is a weird one! The Sixth Doctor is positively creepy at times, and Evelyn is understandably confused and repulsed as she hears of the Sandman’s legacy. 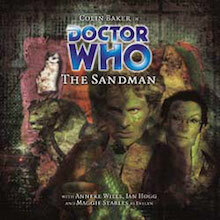 Pros: Colin Baker clearly relishes the opportunity to go into Full Villainy Mode in the Sandman flashbacks. It’s a side of the Doctor rarely seen up to then. 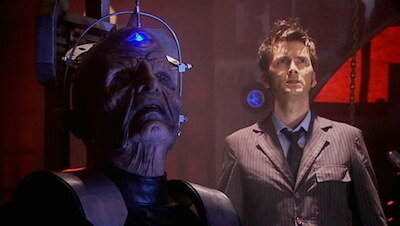 It precedes similar tactics used by the Tenth and even Twelfth Doctors. The nature of the true killer is rather clever. Cons: Big Finish overdid it on the Galyari voices. At the start of the story, the lizard-like aliens’ voices are so distorted and grating that you may be tempted to tune out. The Doctor’s method of defeating the killer is a few feathers short of coherent. A bona fide Big Finish classic. Thrill to the exploits of the Gallifreyan swashbuckler, the Doctor, as he faces off that dread pirate, Red Jasper. Will Evelyn the Pirate Queen find the buried treasure or will she first order the foppish English captain to walk the plank? Yes, this is a comedy, through and through, set within a somber and surprising frame. 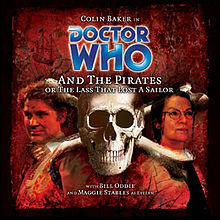 Colin Baker, blessed with a wonderful script, is simply magnificent, going for Gilbert & Sullivan levels of bombast and comedy. Evelyn again is the moral center of the tale, and it’s her morality and empathy that lead to emotional payoffs in both the past and present. Pros: The continuity-packed and hilarious “I am the very model of a Gallifreyan buccaneer…” The never-better chemistry between the Doctor and Evelyn. Red Jasper’s varying opinion of the Doctor’s wardrobe and manner, depending on whether Evelyn or the Doctor is telling the story (I laughed quite a bit). Nick Pegg as the cowardly Captain Swan. The out-of-the-blue emotional wallop in the final minutes. Cons: Probably not for everyone. It IS a comedy. But if you’d let that stop you from listening to this, ye should be keelhauled, you scurvy dog! Evelyn, already grappling with the pain of seeing good people die, now faces the body-snatching deeds of Burke and Hare in 1827 Edinburgh, where the death of innocents is not only certain, but a fixed part of history! 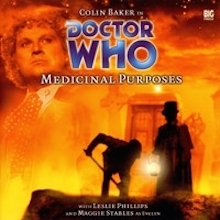 A bold and dark story – featuring murder and prostitution right off the bat – Medicinal Purposes has a fantastic cast, including Leslie Phillips, David Tennant, Glenna Morrison, and an interesting discussion of the historical benefits of murder. Pros: The Doctor’s stance that body snatching was “admirable, but not honorable” and Evelyn’s disgusted reaction to it. His explanation of proper name-dropping. Also, did you see what I wrote above? DAVID TENNANT IS IN THIS! Cons: The time-loop machinations aren’t easy to grasp, and the virus subplot doesn’t help. Any Big Finish audios you’d like to recommend? Do you have a favorite Big Finish Companion? Post your comments below!